First, prep the chorizo. Place the ground pork in a large bowl and add garlic, all the spices, and apple cider vinegar. Using your hands, thoroughly combine the meat and spices. Be careful not to over-knead or squeeze the meat too much—gently work it in. Cover and refrigerate overnight before using. If freezing, portion out half pound sections and freeze for up to 4 months. Next, make the sweet potatoes. Preheat the oven to 400 degrees F.
Wash the sweet potatoes and pierce each sweet potato 4-5 times with the tines of a fork. Place the sweet potatoes on a baking sheet and roast for 40 minutes to an hour, until they’re soft and starting to ooze. While the sweet potatoes are roasting, prepare the chorizo. Heat olive oil in a skillet over medium heat. Add the chorizo and cook, using a spatula to break up chunks, for about 10 minutes until cooked through. Set aside. Add the avocado, water, and lime juice to a blender. Blend until smooth. Add the cilantro and stir. Once the sweet potatoes are done and they have cooled slightly, vertically slice halfway through each sweet potato. Push the ends of each sweet potato together to encourage them to “pop” open. 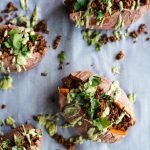 Scoop chorizo into each sweet potato. Drizzle with cilantro avocado sauce. Garnish with extra cilantro.